The electoral campaigns for 2010 will likely be saturated with fiery conservative rhetoric, grassroots organizing, and a widespread and categorical rejection of the policies and programs enacted by the Obama administration. Candidates of all stripes are putting themselves forward to scoop up vulnerable seats, and if they know anything about the discontent masses looking to put their carbon footprints on a few incumbents’ foreheads, then they’ll be preaching that tried-and-true conservative message that has worked so well in the past: limited government, low taxes, and free enterprise. Like a broken record, though, this popular message keeps repeating itself and has grown to be fairly annoying in its ineffective superficiality. The back-and-forth reign of the two party system has created a circumstance where the malfeasance of one party’s elected officials creates a groundswell of support for the loyal opposition, with the same happening in the reverse an election or two later. And yet despite the sound bytes and campaign slogans, elected conservatives have done a horrible job at implementing the promises they made when running for office. Government has exceeded every limit that once sought to restrain it, taxes are more numerous than the number of pages in the latest health care bill, and enterprise, burdened with regulations, licensing, and bureaucratic impositions, is anything but free. Conservative challengers to congressional incumbents have wisely focused on the Constitution as a means for advancing their campaign and winning the hearts and minds of the delegates who might vote them into office. With organized groups such as the Tea Partiers, 9/12 Project, Campaign for Liberty, and a few others, anybody who stands a chance of gaining sufficient support to overthrow an incumbent must tap into this resonating message of constitutional limitation on government if they want to win. Even so, merely paying homage to the Constitution and making frequent mention of it is not enough. People have often won elections while campaigning on a key issue (transparency, no more war, a humble foreign policy, etc. ), only to discard that objective once in office. Delegates and voters alike must dig deeper into the platforms and positions of the various candidates and ensure that their support of the Constitution is not superficial, and therefore short-lived. It is easy to profess support for the Constitution; it is not easy to vote against bills that have the support of all of your partisan colleagues, yet are patently un-constitutional. It is easy to talk about limited government; it is not easy to strike at the root when the programs and departments that will suffer are staffed by people who needs jobs, and which serve those who are society’s most needful individuals. It is easy to nebulously claim that you will vote in harmony with the Constitution on every vote; it is not easy to vote down a bill that is justified by alarming expediency, widely supported by your constituency, or that simply seems to be a good idea. In short, conservatives all over the country are plagued with a superficial knowledge of and inability (or unwillingness) to faithfully implement the numerous restraints imposed by the Constitution. Voters have been subjected to constitutional hypocrites for decades—aspiring candidates promising to channel the Founders and fix the federal government, but ultimately contributing to its continual expansion and intrusion into our lives. 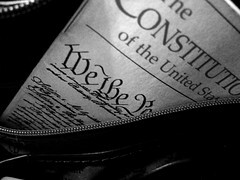 What America needs is not another batch of people using the Constitution as a campaign slogan or marketing tool, but honest and wise individuals who deeply understand and are willing to implement its disinfecting simplicity and principled restraints, regardless of how expedient, favorable, or necessary the alternative may be. The Constitution was written so as to be read by average Americans. But most average Americans do not read the Constitution. If they have ever read it, they currently have little memory of what it contained. This is a triumph of the big government establishment. They have succeeded through years of strange executive, legislative, and judicial wranglings in turning a fairly clear document into such a bizarre convoluted mess that the average American despairs of making any sense of it at all. People don’t bother to read it because they know that it bears little semblance to the real rules by which the country is run today. I wonder if it would be wise to require all officials wishing to run for office to pass a comprehensive Constitution test. If they don’t pass, they can’t run. I am reminded of my niece who married a fellow from England. He was applying for citizenship in the USA, and he had to learn about the Constitution. I tried to inform him of all the Constitutionally corrupt things in our government today, and he told me he didn’t want to hear it. His reasoning to me was that he wanted to become an American, and he wanted to believe the USA was good, not bad. But, as he studied into the Constitution in order to pass his citizenship test, he came to me and said I was correct – – what is happening now is NOT constitutional. Even he could see it, but normal Americans cannot. @Jim Davis: Ironically, such a suggestion would probably be determined to be unconstitutional. The author makes some good points, but also has some extremely fuzzy logic. Extremely fuzzy. The Constitution DOES specifically mention that the STATES will have the right to govern on all other matters. So his examples are quite irrelevant. I don’t mind analysis or even strict constructionism, Jeff – I just have trouble trusting anybody who’s very certain they understand this stuff. Can you point me to the selection you mention in a quick e-mail?